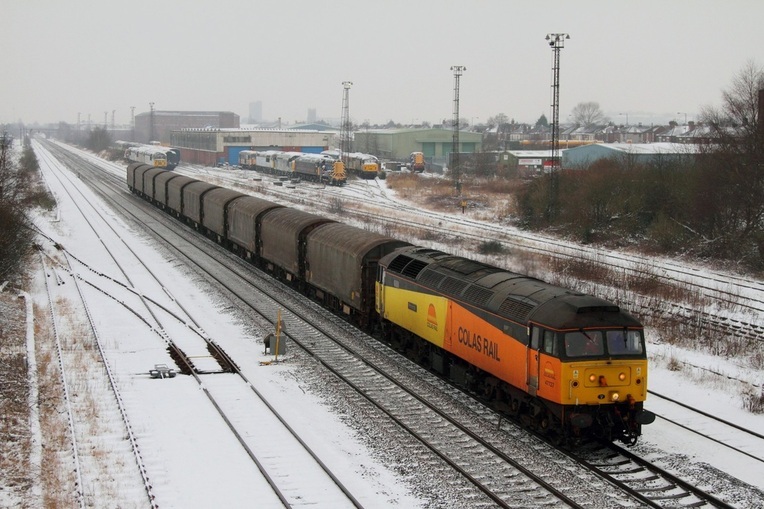 Colas Rail 47727 powers the mighty 6E07 Washwood Heath to Boston Docks steel train passing the ex-Wagon Depot and now Nemesis rail depot at Burton on the 19th January 2013. The train was caped yesterday which resulted in the Colas operated service making a rare appearance on a Saturday. 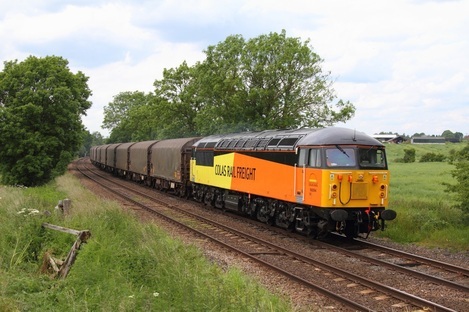 Colas Rail freight having bought 56087, 56094, 56105 and 56113 from EMR Kingsbury, have successfully restored, repainted and returned 56094 to the mainline. The other class '56s' should soon follow in 56094's footsteps and are being restored at Washwood Heath. 56094 since its comeback has been glued to the Boston steel diagram (6E07 11:51 Washwood Heath to Boston Docks and returning 6M08 17:20 Boston Docks to Washwood Heath). Left: 56094 powers the 6E07 Washwood Heath to Boston Docks covered steel train at Chellaston east of Stenson junction on the 20th June 2012. 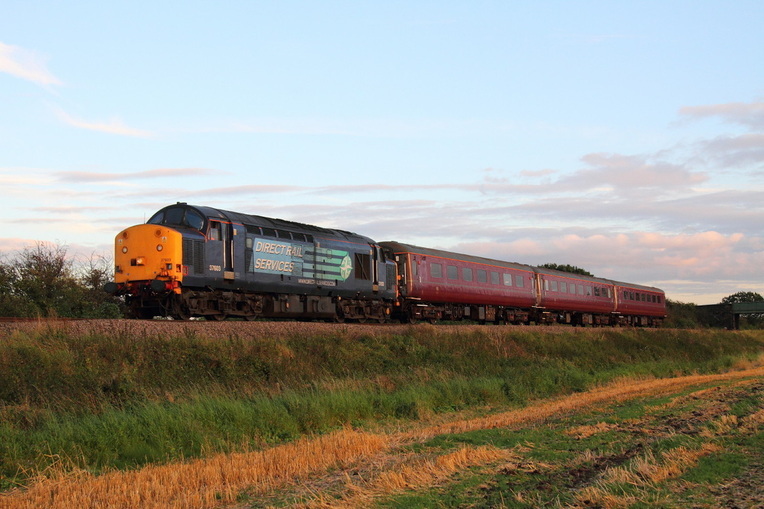 47739 has also been a regular loco on this diagram alongside 56094. 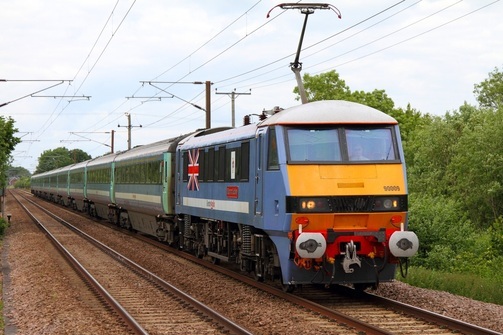 To mark the importance of the Diamond Jubilee, several train operating companies have marked the speical occasion with special livery variations. DB Schenker repainted 67026 into silver (similar to 67029) with the application of special union flag vinyls. The locomotive has made over a dozen outings on the Royal Train. First Great Western outshopped 43186 with Jubilee colours and lettering to mark the prestigious event (photograph can be seen in the Home Page banner). Stratford's 47 Group have repainted 47580 into Br Blue with a large Union Jack and white roof in the same famous style of 47164 and 47163 for the Queen's Silver Jubilee (Photographs can be viewed in Latest News). Right: Great Eastern lines network repainted 90009 and applied a Union flag as well as the traditional white roof and named the locomotive 'Diamond Jubilee'. The locomotive is photographed at Great Moulton near Diss working the 1P43 14:00 Norwich to London Liverpool Street on the 23rd June 2012. Also noticeably, many units have also received new livery variations to mark the Diamond Jubilee, such examples include 357006 and two London Underground Jubilee line trains have received vinyls for the Diamond Jubilee. East Coast 91110 ex-91010 which holds the record for the British locomotive speed record at 162mph (achieved at Stoke Bank, north of Peterborough, on the 17 September 1989) was the most appropriate choice to carry a special livery variation to commemorate the Royal Air Force and their efforts in the Battle of Britain during WW2. 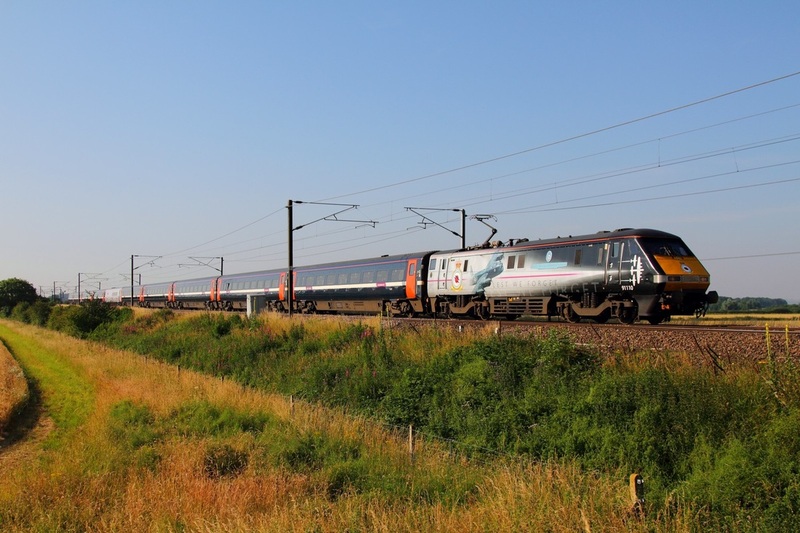 Like 91101's Flying Scotsman livery, the unique memorial livery is based on the East Coast livery with a black front-end with Spitfire, Hurricane and Lancaster images, 'Lest we forget' branding and the RAF Memorial Flight logo. 91110 was unveiled and named by TV star Carol Vorderman 'Battle of Britain Memorial Flight' at the York NRM Railfest event in early June 2012. The nameplates are in similar style to the Southern 'Battle of Britain' Pacific scheme. 91110 in its new Battle of Britain livery storms through Claypole powering the 1D15 13:03 Kings Cross to Leeds on 30th June 2012. 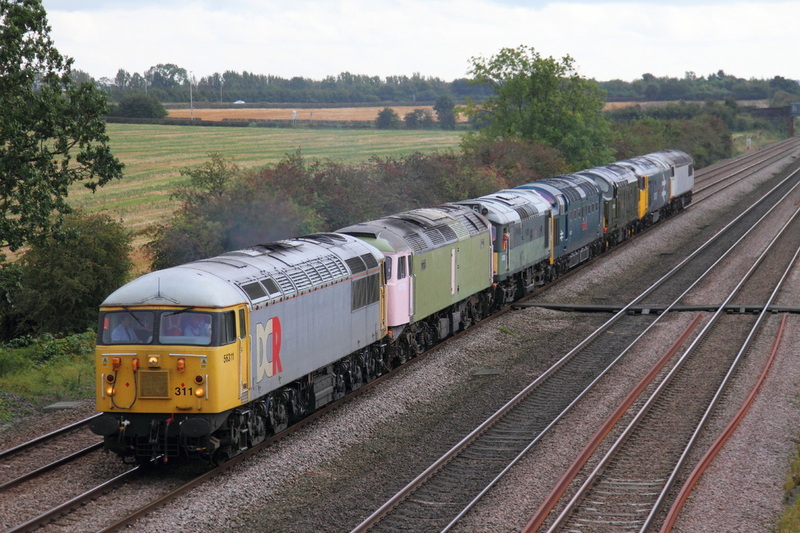 On the 1st October 2012, I captured DCR 56311 leading under-coat 47765, 25279, 55002, D6700, 50026 and 56091 at Cossington as the 0X56 Fletton to Hotchley Hill. Running 39minutes late, DRS 37610 leads 37607 on the 1Q13 Derby RTC to Hither Green test train at Cossington near Leicester on the 29th September 2012. NOW ADDED: PHOTOGRAPHS FROM FOUR DAY VISIT TO SCOTLAND!!! 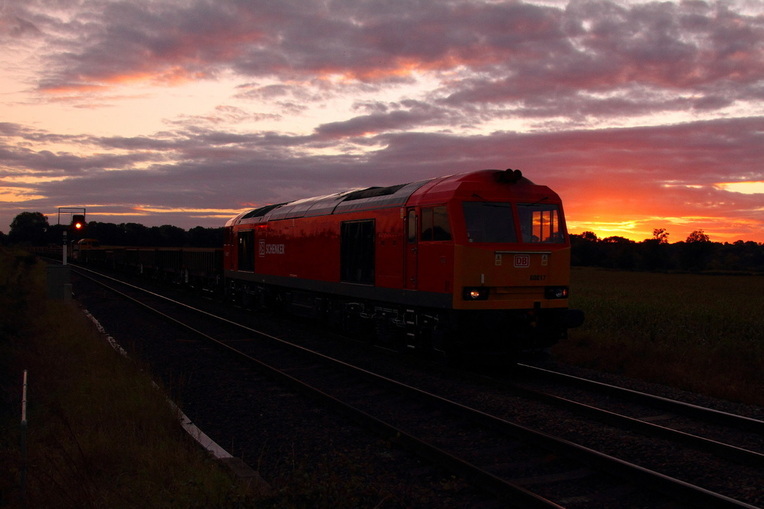 HOME PAGE PHOTOGRAPHS: DB Schenker liveried 60017 powers the 6L15 Toton to Whitemoor at Rearsby on the 28th September 2012. 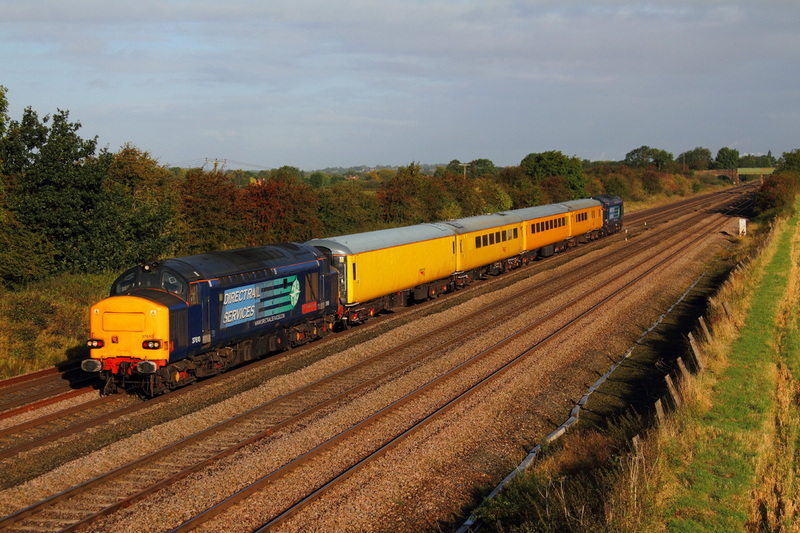 Below: 37603 leads the 5Z18 Wembley to Derby RTC at Cossington on the 28th September 2012.